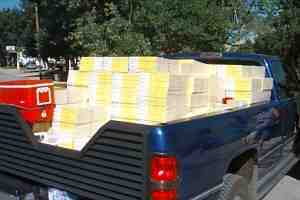 Oh boy, the new phone books have hit town! The locals make quite a ruckus as they gather around this pickup, jostling for space, and a chance to be first to see the new exciting numbers. A few fights break out every year. They used to be able to call in 'Ma Bell' to keep the peace, but what are you gonna do in the brave new world of deregulation?